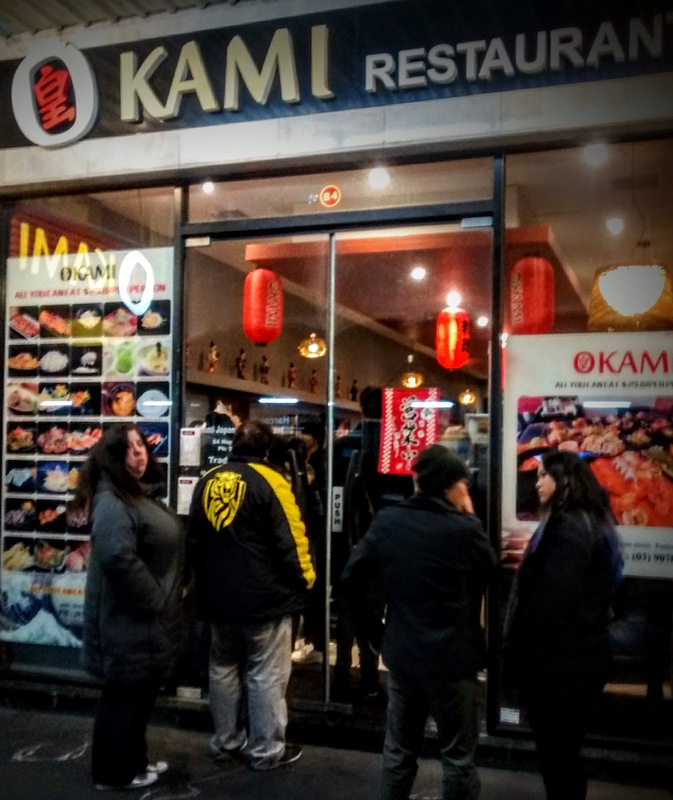 Okami appeared in the place of 1+1 Dumpling Noodles a while back, so when I spotted a groupon deal for their all you can eat option, we decided the time had come to pay a visit. We booked for the 7:45 sitting on a Friday evening, the alternative being 5:30pm. On arrival a couple of minutes early there were people waiting inside and out in the cool winter air. It took about five minutes for us to get seated once the doors were thrown open, and most of the tables were soon full. Inside the decor had changed in the new incarnation, with new lampshades, carpet and furniture. We picked a few dishes from the menu and ordered fairly quickly. We didn't have to wait too long until our dishes appeared. The Edamame was first to arrive, the boiled soy beans with tehir sprinkle of salt were fine, without being the best we'd ever tried. The prawn gyoza had a tasty filling, but the skins were tough rather crunchy on the base. The Seafood Tempura featured prawns and veggies in the eponymous batter. The coating was light and crunchy without any greasiness, and the content all nicely cooked. The sashimi was the most impressive looking of the dishes we chose and he fish and seafood was fresh. After polishing off the first 4 plates we tried to order more dishes, but it took quite a while to get the attention of a waitress. We then faced another lengthly wait before any more dishes appeared. The Agedashi Tofu of crisply fried served with fish broth and bonito flakes, delivered a crisp exterior with around the soft tofu inside. We also had some more gyoza and sushi which I didn't manage to snap. We ended up leaving before the final tempura arrived as there seemed to be some confusion after further delay, and we'd been there for nearly an hour and a half. The normal price for the all you can eat menu is $29.80, our groupon was $55.50 for two with a small flask of Saki. Given the deal, the meal was reasonably good value, but the slow service probably due to how busy it was frustrating. I'd think about going back on a week night if it was looking quieter, but wouldn't be keen to tackle it on a busy night, or if we did would make sure the first order was big enough to avoid the need to have to put through a second. I'd be interested to hear if anyone else has been on busy or quieter nights!